Mickey has been around since the dead sea was ill… lol I have had the opportunity to recommend him to clients and as yet have not had any complaints! 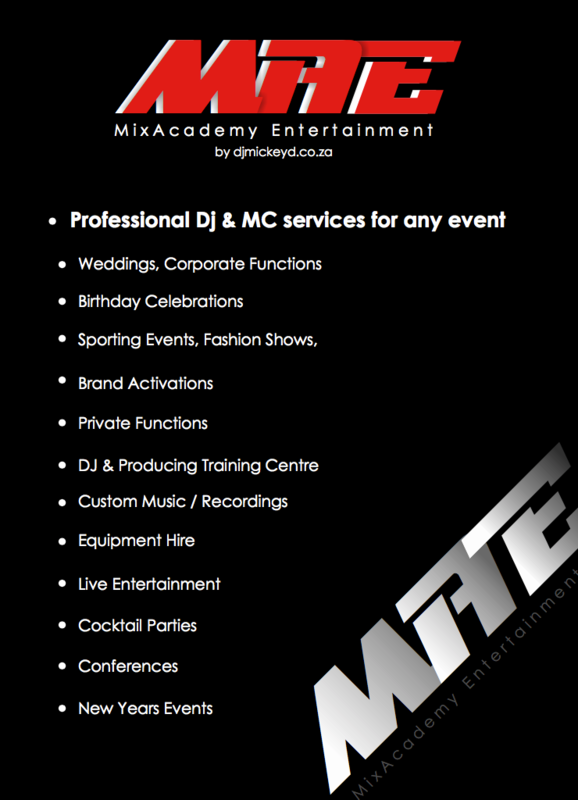 In a nutshell: We are a Dj & MC Agency based in the Garden Route. We supply Dj's & MC's for weddings, corporate events, birthdays, sporting events and much more! You can hire us complete with sound and lighting equipement or simply a Dj or MC for your event! Dj Mickey D as a brand started up in 1994 in the entertainment industry, and he has been blessed with the fact that his career has shaped and grown from strength to strength for more than 2 decades. He learned many valuable lessons along the way and he gives God all the Gory for carrying him through absolutely everything and he is always deeply grateful gifts, talents and abilities. It has empowered him to reach, achieve and not only personally grow, but also teach and share his knowledge with his team, students, as well as other entertainment contractors, artists, engineers and dj's that he worked with over the years. His approach is simple – understand what is required, do it to the best of your ability and KEEP IT SIMPLE! The key lies in the planning and prepaeration! MixAcademy Entertainment was born in 2008 when Mickey launched his Dj School. The brand grew into a fully fledged Dj & MC agency supplying a host of services from Dj's to Equipment Hire, MC services to doing all sorts of interesting, amazing and creative events. 2014 / 2015 got so busy, we needed more hands – it probed us with making a call to initiate an internship for high school students so we can empower younger learners to get involved and trained in various aspects of the industry – dj'ing, production, engineering and producing. With Mickey being involved in Youth ministry, he soon realised the importance in investing time in our Youth. The seeds we plant today, will result in the standards manifesting in 10/20/30 years from now. Mickey takes every intern under his wing and gives them hands on training on the same level that we deliver our products and services to our clients. We are a Dj Solutions Company with a team of dedicated and experienced Dj's & MC's!